In this second part of the feature on Nei Xue Tang (click here for Part 1), I’m taking my vacation in Cambodia as an opportune time for me to write about the Khmer collections of this museum of Buddhist Art. A lot of the major sculptures – the ones we’re interested in anyway – are all located on the ground floor of this four-storey building. The reason? It’s just too big to move upstairs! 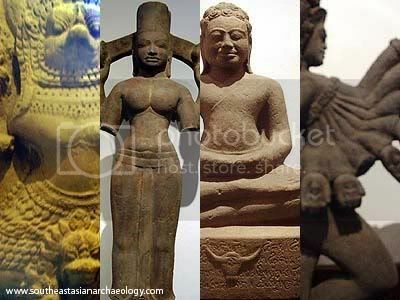 Here are four examples of Khmer art found at the museum: a 12th century statue of a Garuda (a mythical bird), a pre-Angkoran statue of the goddess Durga from the 7th century, an Angkor Borei style seated Buddha, and a dancing Hevajra from Bayon in the 13th century. I’m not all that familiar with the iconographyof Hindu and Buddhist art, so unfortunately I can’t write anything more about them. See the bull’s head at the base of the seated Buddha from Angkor Borei? If you look closely enough, you can see that the base of the entire statue is lined with Khmer inscriptions! 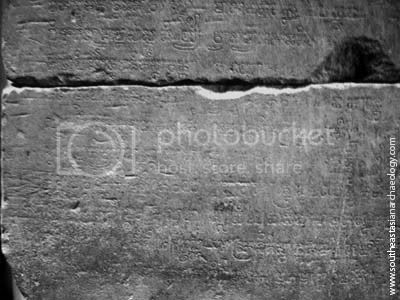 I’ve tried to enhance an image on the inscriptions, but they aren’t all that clear. Mr Woon, the owner of Nei Xue Tang tells me that he is arranging to get the inscriptions translated. That’s not the most impressive example of ancient inscriptions in the collection, however. Again on the first floor, is another huge slab of stone with a carved seat Buddha at the base. At first glance, it seems like an ordinary slab of stone with an attached decoration. But on a closer look, one realises that the entire face of the slab is carved with inscriptions! This slab is dated to the Baphuon period of the 11th century. Strangely enough, most visitors to the museum usually skip this stele, according to museum owner Mr W. S. Woon. Granted, it’s not the most visually appealing of all the exhibits, but in my view it’s potentially one of the most richest sources of information among the entire collection of some, 10,000 pieces. The inscription has not been translated as well – this piece was in fact a bequest to the museum by a group of donors. The bulk of the artefacts featured in this series is focused on the material culture from Southeast Asia – however, I must add that it is only a portion of the exhibits on display which also include various examples of Chinese, Tibetan, Indian and Nepalese art, as well as a vast array of Buddhist relics from ancient to more recent times. If you’re ever in Singapore and you’re interested in examples of Buddhist art, you should pay Nei Xue Tang a visit. SEAArch would like to thank Mr Woon and Nei Xue Tang for the permission to take photographs for this post. nice. got not chance go cambodia yet. one day i will. Glad you are keeping us informed of your travels. Interesting stuff!